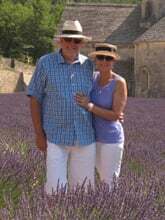 One of the best ways to enjoy the spirit of our Aroma Tours adventures is by taking a peek at some of the 1000's of lovely photos we have taken during our travels in Spain, Dordogne, Turkey, Provence, Italy and Bali. We have also compiled some of the beautiful images kindly contributed by our past Aroma Travellers chronicling the delightful experiences that we have shared together from a more personal perspective. Imagine if you will, a sunny afternoon in Provence sitting on a beautiful garden terrace under the dappled shade of plane trees with an aperitif of Kir Royale in hand. The fragrance of flowers and the crusty aroma of freshly baked olive bread rolls wafts lightly on the gentle breeze and the discrete, efficient, bustle of waiters and gentle song of cicadas in the background lulls you into a relaxed anticipation. Your amuse bouche arrives, heralding the start of proceedings; as much a work of art as a delicious amusement for your mouth. This "time outside of time" will last for over three hours, as a procession of gastronomic delights are presented with flair to captivate your taste buds. You feel unhurried, totally looked after and content, each act of the meal just right and arriving with impeccable timing. In all of our journeys in Provence we love to share the joy of experiencing the cuisine and gastronomic traditions of the regions we visit, savouring the tastes and aromas of fresh seasonal ingredients prepared with practiced skill, care and pride in preparation, combined in a myriad of ways to bring us these delicious moments to enjoy. Little Benedict, the shepherd, was born circa 1163 in south eastern France and spent his early years tending his mother's flocks near the banks of the mighty Rhone river close to Avignon. 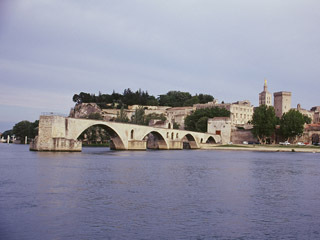 Having reached his early teenage years, Little Benedict became known by the name Benezet and during the solar eclipse of 1177 he experienced a vision where a voice ( said to be that of Christ ) commanded him three times to go to Avignon and see to it that a bridge was built across the swift and treacherous river. He was assured that angels would watch his flocks while he was gone. And so he immediately went to the bank of the Rhone river where he purchased passage across to Avignon with his last three coins. Benezet announced his mission to the Bishop of Avignon, who took him for a fool and sent him to be judged before a magistrate. The magistrate decided to test Benezet by challenging him to move a large boulder in order to prove his virtue. Benezet is said to have easily carried the weighty boulder to the place on the Rhone where the bridge was to be built. This "proof" convinced the Avignonese to begin construction of the bridge. For the next seven years Benezet worked gathering labourers and financial support for his bridge and in circa 1181 he created the "Frares Pontifices" ( Bridge-building Brothers ) to assist him in gathering funds to continue building and maintenance. The bridge was finally finished in 1185 and consisted of 22 arches with an overall length of 900 m ( 2950 ft ). Unfortunately, Benezet died before seeing it completed. As a result of his devotion and a series of "miracles" that are said to have occurred during the bridge's construction, and at the site of his tomb after his death, the people of Avignon were convinced that he was in fact a saint. They started referring to him as Saint Benezet and built a chapel on the bridge to enshrine his relics. The church agreed to canonize him shortly thereafter. The Bridge of Saint Benezet was of great strategic importance, being the only fixed river crossing between Lyon and the Mediterranean. Over the years, the bridge needed to be rebuilt several times due to flood and strife until its final demise in 1669 when it suffered a major collapse due to a catastrophic flood. It was subsequently abandoned and no more attempts were made to repair it. Since then, its surviving arches have successively collapsed or been demolished. Only four of the initial 22 arches remain intact today. One of the most tantalizing experiences we enjoy during our Turkish Aromatic Odyssey is visiting a Turkish rose distillery while it is in full production. The heavenly smell of Rosa damascia petals - hand picked before dawn - fills the air. We see them by the tonne, spread out on the floor to prevent them from fermenting before being loaded into huge copper stills to be transformed into pure rose essential oil. The fruit of all of this labour is a pale yellowish oil with a heavenly aroma, which is carefully decanted into waiting flacons. 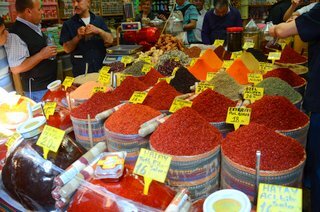 To experience first hand the distillation of this most exquisite treasure of nature is a total feast for the senses. The water that exits the stills is saturated with a rich rose fragrance, some of which is retained as finest rose water. What an irony it is to see 1000's of litres of this glorious warm rose water flowing past in a viaduct with bees searching in vain for the flowers their instinct tells them must be there. Naturally when one is confronted with a room full of fragrant rose petals there is nothing for it but to plunge right in! Ephesus is one of the world's greatest ancient sites and has an incredibly rich history. 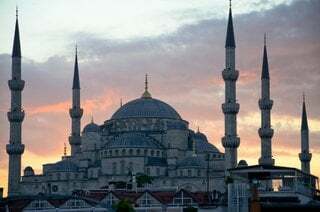 It began as a Greek Ionian colony in the 10th century BC on the west coast of what is now modern Turkey and grew into one of the most important cities in Asia Minor. It was one of the twelve cities of the Ionian League during the Classical Greek era. and in Roman times it grew to a population of over 250,000 people ( 1st and 2nd centuries AD ), making it the second largest city of the Empire. Up until the Roman era, rule of Ephesus changed to the Lydians under king Croesus then the Persian empire, followed by Alexander The Great, Ptolemy III of Egypt and the kings of Pergamon. Ephesus finally came under Roman rule in 86 BC. Systematic plunder and high taxes were imposed by the new masters, however, in 27 BC Augustus lifted the prestige of Ephesus by making it the capital of Roman Asia Minor. 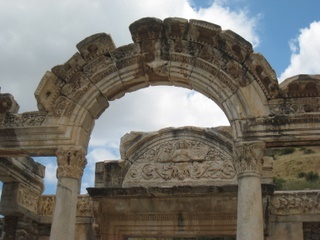 The grandeur of Ephesus is indicated by its buildings such as the library of Celsus ( shown as it is today, above ) which once held nearly 12,000 scrolls, the temple of Artemis, one of the Seven Wonders of the Ancient World. 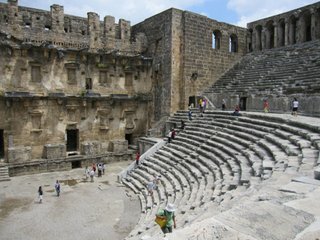 The theatre of Ephesus had a seating capacity of approximately 44,000 people and is generally regarded as the largest outdoor theatre in the ancient world. Ephesus was an important centre for early Christianity and the apostle Paul lived and preached there circa 50 AD and also wrote 1st Corinthians whilst there. It is also suggested that the Gospel of John was written in Ephesus and both John and Mary the holy mother, are believed to be buried close to Ephesus. For much of the Byzantine era ( 395 - 1071 AD ), Ephesus remained the most important city in Asia Minor after Constantinople and the emperor Constantine rebuilt much of the city and erected a new public bath. Also in the 6th century emperor Justinian I built a basilica to St. John over the supposed site of the apostle's tomb. The gradual silting up of its harbour and consequently lost of trade, as well as Arab invaders in the 7th and 8th century, led to Ephesus's decline and by the 15th century it was completely abandoned. Today it is a spectacular place to visit and one of the largest and most important Roman sites in existence - even though it is currently only 15% excavated! 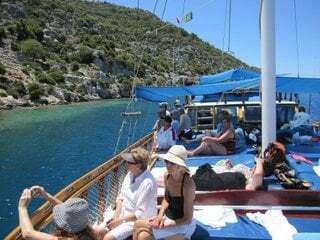 Ephesus is one of the ancient sites we visit during our Turkish Aromatic Odyssey and to be in such an amazing place walking in the footsteps of the ancients is a very stirring experience indeed.